Come for the small town charm, stay for the food. This travel guide is going to sound like a fat kid wrote it and we have no shame. Portland is a foodie wonderland - it's filled with award winning restaurants all within walking distance of downtown, and they do not disappoint. Get ready to gain a few lbs because you're about to pack a lot of eating into a quick weekend trip. We've got where to stay, eat, and drink listed out below. Use the table of contents to jump around. 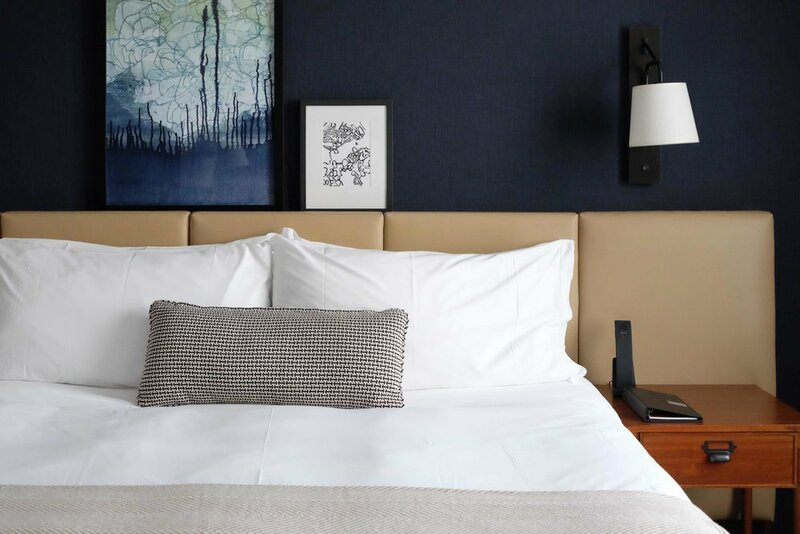 The Press Hotel is an adorable boutique design hotel centrally located in downtown Portland. It was built inside the renovated Gannett Building, which housed the offices and printing plant of the Portland Press Herald, the state’s largest newspaper. As you might have guessed, the entire hotel is "printing press" themed with typewriters hanging from the walls, old headlines converted into funky wallpaper, and gorgeous industrial furnishings. The rooms were designed to feel like 1920s writers' offices. Prices are very reasonable for how nice the hotel is (rooms start at $199/night). Book here. #WildTerrains tip: Make a trip to the gym between eating events - it's small, but it's one of the nicest hotel gyms we've ever seen. Plus, they have trail mix hidden in the drawers next to the water (because, ya know, more food can't hurt). Part oyster bar, part seafood restaurant with strong cocktails and the best lobster roll you will ever have in your life. Eventide has topped best restaurant lists since it opened in 2013 and it lives up to the hype. There's always a line - so make a reservation or be prepared to get cozy at the bar while you wait. #WildTerrains tip: If you're headed to Central Provisions for brunch you should get there at 10:55am and wait by the front door. They open at 11am and by 11:15am there wasn't a single free seat in the house. Piccolo is an adorable family-run Italian restaurant near the center of town. They're known for their seasonal dishes and special events. Every Sunday they host Sunday Supper for a lucky 6 guests who get to feast on a 6-course blind tasting menu at the chef's counter for only $68. Reservations for this get snapped up early, so definitely plan ahead. If you get stuck with the normal menu, don't stress, it's hard to go wrong here. We had the crowd favorite - cavatelli with lamb ragu - and wanted to lick our plate clean. Closed Mondays & Tuesdays. If fries & milkshakes are your thing, then Duckfat is your thing. Super small, super casual, and great hangover food. We suggest coming here for brunch or lunch after a late night of drinking. Their fries are fried in - yep, you guessed it - duck fat. Milkshake options include: Sea Salted Duck Fat Caramel, Tandem Roasters Coffee, and Wild Maine Blueberry. Need we say more? A bit more upscale than the other options on this list, Street & Co. is somewhat of an institution in Portland. The restaurant has been open for over 25 years and is continually rated one of the best seafood restaurants in Portland. The owners have a few other top-rated restaurants in town (Fore Street & Scales). We had the lobster & linguine & the bourbon pecan pie for dessert. #WildTerrains tip: When we travel, we love eating at the bar instead of a table in restaurants - it makes it easier to chat with the bartenders and other diners. So, if the hostess seats you there, embrace it! Scales is a new venture from the Street & Co team and a great option for lunch. The space is bright with large windows looking out to the boats and fishermen on the wharf. Order a glass of rose and the lobster roll (see delicious-looking lobster roll photo above). Hunt & Alpine Club is a super hip Scandinavian bar serving craft cocktails and gourmet bites in one of downtown Portland's adorable town squares. It's a great spot for afternoon or after-dinner drinking. Their cheese plate (called The Skier) was seriously impressive and loaded with local cheeses, jams, pickles & homemade crackers. The Honey Paw is a newer Asian restaurant right next door to and from the team behind Eventide Oyster Co. We didn't eat here, but we had cocktails at the bar while we were waiting for our table at Duckfat - it's right down the street. We loved The Liberade (unfiltered sake, green tea syrup & lime) and The Dickel Sour (rye whiskey, lemon, sugar, egg white, bitters). Let's start off by saying that we seriously debated whether to put Tandem in the nosh section or here. At it's core, Tandem is a coffeeshop that serves fabulous coffee that they roast at their original cafe location on Anderson Street. And while both locations are awesome, you're going to the Congress Street location and here's why: (1) the architecture of this building is super unique since it was originally an old gas station that was built in the 1960s. (2) the bakery is headed up by Briana Holt and she is pretty much a bakery goddess. We would seriously buy a plane ticket to Portland just to eat another one of her loaded buttermilk biscuits or giant cinnamon buns. #WildTerrains tip: Get there on the earlier side if you can - the most popular baked goods sell out. A cute local coffeeshop in the center of things. We popped in almost every morning to grab some early morning caffeine before starting our day. They have lots of tables and free wifi for anyone needing a spot to catch up on some work. If you're staying at The Press Hotel, you can rent bikes for free and ride them anywhere in town. We rented them for an afternoon and rode all the way to the Portland Head Light - a historic lighthouse in Cape Elizabeth, Maine. This is obviously not really an option in the wintertime, but if you're visiting during the spring, summer or fall, it's a great way to break up your day between lobster roll meals. The Eastern Promenade is a public park with a paved waterfront trail in Portland. It's a great place to walk, run or bike if you're looking for something active & scenic to do.